New app puts real-time agricultural tyre pressure information just a photo and a couple of clicks away. It can instantly work out the most appropriate tyre pressures for the desired load and speed on any farm tractor, ensuring users can access a bespoke tyre set-up in the field. Michelin is making it much easier for farmers and contractors to get the most out of their tyres, by launching a new farm tyre pressure app for smartphones. The new app, which Michelin claims is a one of a kind in the market, puts real-time agricultural tyre pressure information just a photo and a couple of clicks away. It can instantly work out the most appropriate tyre pressures for the desired load and speed on any farm tractor, ensuring users can access a bespoke tyre set-up in the field. Using the Michelin Pressure Calculator is straightforward, with three easy steps for the user to follow. Firstly, the user must enter the weight of the load supported by front and rear axle. Then they must select the size and type of Michelin tyre fitted to the front and rear of the tractor using the drop down menus. Once that is complete the farmer must take a photo of the tractor on their smartphone. The app’s built-in camera function is able to calculate the precise load distribution and the length of the overhang, measured from the wheels, to help define the optimum pressure recommendations. Results can be saved in a special ‘My Tractor’ folder or shared by email. 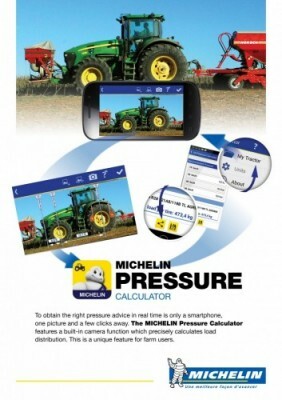 The Michelin Pressure Calculator mobile app is downloadable for free on Android devices, and will be released on iOS in January 2015. It is available in four languages: English, French, German and Spanish.